Life cycle: This insect usually produces two generations each year. The Borers overwinter in the inner bark. 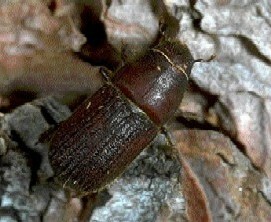 Physical Description: The 1/8 inch long, grub is white with a reddish head. The adult is a black or dark brown beetle with red wing tips and is about 1/10 inch long. 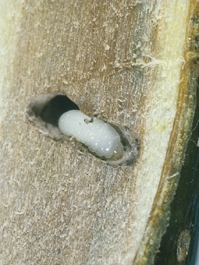 The eggs are laid in galleries bored parallel to the grain of the bark. Feeding characteristics: This pest will attack almond, apple, apricot, cherry, peach, pear, plum, and quince trees. 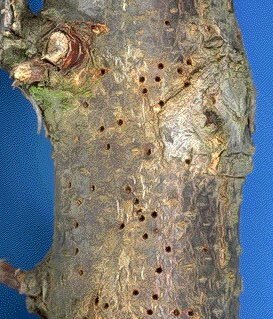 The adults damage trees by drilling small, round holes in the bark as they enter and exit. Both the adults and the larvae feed on the inner bark, producing a many galleries shaped like centipedes. Controls: This pest prefers injured and weakened trees. Therefore, keep trees as vigorous as possible by utilizing an organic fertilizing program. White wash the lower trunk and branches to discourage egg laying. Prune and burn during the winter any limbs with shot holes.